EverBlock 24" x 48" Desk Top - White EverBlock® modular building blocks are perfect for all types of modular creations. Combine this desk top with oversized plastic blocks to build modular furniture, decor, props, displays, and much more. 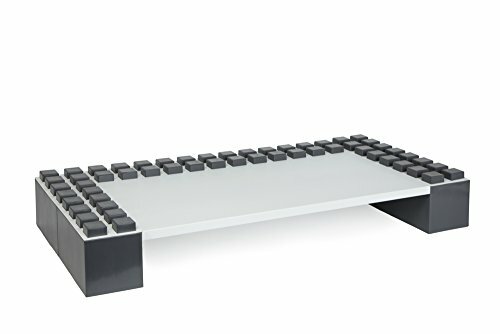 Color: White Each 24” x 48” Desk Top includes: -1 Powder Coated Metal Desk Top (48" x 24" x 1") - White Contains square receiver holes on three sides, allowing for nesting on EverBlock building blocks' connector lugs for a snug and stable fit. The Desk top has 36" of open space when nested. Leave lugs open for cool modular look or finish of with EverBlock finishing caps for a clean refined look. All blocks sold separately. Combined packs and add blocks and shelving as needed to modify desk design. Modular plastic building blocks & accessories allow you to build the objects of your desire. If you have any questions about this product by EverBlock, contact us by completing and submitting the form below. If you are looking for a specif part number, please include it with your message.